If you haven't been following along the past couple of days, make sure you go back and read Part One and Part Two of this series of posts! Today, I'll share some more of my frantic questions and God's gentle answers during my hardest time of adjusting to life as a missionary mom. My frantic question: Wouldn’t it be easier if you had stayed in the States? Isn’t this just too hard for you? Does anyone else have a washing machine like this? We all know the challenges of moving to a new country, learning a new language, and building a new life and ministry. During my first couple of years here, I was completely overwhelmed by these challenges. It's interesting what still sticks out to me years later... a police officer yelling at me and refusing to help me our second week here, not knowing how to use our "semi-automatic" washing machine, being robbed several times, not being able to find relief from the tropical heat, ants and bugs everywhere, moving into an unfinished house with no furniture, really hurtful conflict with other missionaries, being terrified of driving here, receiving judgment when I needed acceptance, our house flooding repeatedly, trying to climb up onto our house's overflowing water tank when I was pregnant and my husband was out of the country... and so much more. Yes, life was easier in the States, and this all just seemed too hard. His gentle answer: You are not called to a life of ease. What you are experiencing now is too hard for you to handle on your own; you can only handle it through My strength. You can’t do it by yourself. Lean on Me. I couldn't do this new life in my own strength. In the States, most of the time, it was something I could handle pretty well (so I thought), on my own. It was bringing me here to Costa Rica that taught me how I truly dependent on God I really am. This is a lesson I have to repeat to myself just as often as this question attacks me, which, I have to admit, is often. But, God's answer is the same: "Lean on Me, Sarah." Another frantic question: Wouldn't it be more strategic to be in a more "unreached" area? His gentle answer: I've asked you to be a blessing where I have placed you, which is, for now, Costa Rica. Value this more than man's statistics, charts, terms, and opinions. Those were just the words I needed to hear from Him to conquer these doubts and lies I was allowing to run so rampant in my head. What's really exciting about this is that letting go of these insecurities lead us to a place of recognizing a strategic need for ministry focused on maturing the Latin American church, who we believe are playing and will continue to play an increasingly important role in the growth of the Church worldwide. This understanding eventually lead us to a completely different role and ministry than we originally came to Costa Rica to do... and we are so thrilled to be part of it! Please share what frantic questions you have struggled with about your role and place of ministry. What gentle answers has the Lord given you to these questions? Come back tomorrow to chat with us about this, and then again on Wednesday for the final post in this series! Nothing serious right now (I'm tired! 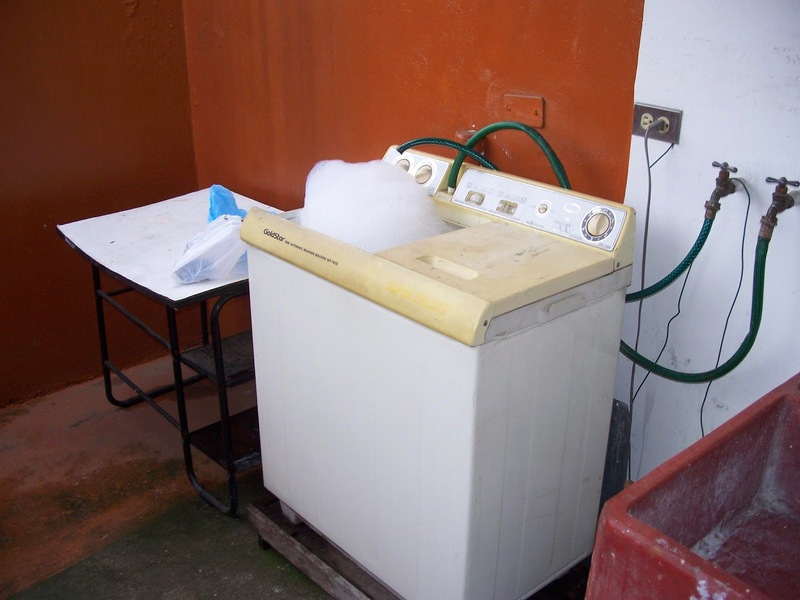 ), but, yes, I used a washing machine just like that on a short-term trip to PNG. Then, in Russia, up until our third child was born, I had something like half of that. It didn't have the spinner side, just the swisher. It looked like a barrel, with the motor in the base, filled and drained with hoses to the sink or tub. Yay for semi-automatic washers! What was hard about it is that I had no idea what to do with it when we first moved in. Once we figured out that you had to fill it with water from hoses, and the whole process of manually filling and emptying it, it finally made sense! I loved the swisher side for getting enough water out to hang the clothes to dry; it would be hard for me to go to one without it like you had in Russia! I've felt the same way...(I'm feeling it now as I wait on a blood test to see if I have measles, in the Thai heat, in my apartment where I fight a battle to keep the geckos and bugs and critters at bay)... I commented on an earlier post how God answered me, and overall I find...He is faithful! So good for me to read about the difficult and unexpected, thank you for edifying!